© MARK MILLER/SCIENCE SOURCEHuman brain tissue is a matter of gray and white. Gray matter tissue derives its moniker from the hue it acquires because of its concentration of neuronal cell bodies and surrounding blood vessels. About half of your brain’s volume is white matter—slender axonal fibers, insulated by fatty myelin, that are bundled together much like large cable cords and have a whitish color. These winding tracts connect distinct brain regions near and far. White matter is now the object of close scrutiny, with multimillion-dollar efforts underway in the U.S. and Europe that aim to map and characterize the structural and functional links—the connectome—of the healthy human brain. Starring in these projects is diffusion magnetic resonance imaging (dMRI), a specialized type of MRI in use since the mid-1980s that is revealing white-matter structure in unprecedented detail. Diffusion MRI takes advantage of the fact that water in brain tissue more readily diffuses parallel to axons than across them. In contrast, in the brain’s gray matter and extracellular space, water moves more freely in many directions. 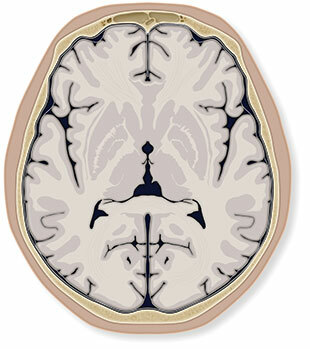 Accounting for these differences in diffusion has allowed researchers to indirectly infer the shape of white matter in the brain, and to begin to study disruptions in its structure caused by traumatic brain injury and by white matter disorders, such as multiple sclerosis or leukoencephalopathies. In the past few years, however, scientists have learned that the mainstay method of dMRI, called diffusion tensor imaging, or DTI, doesn’t reveal the true twists and turns of white matter highways. Two newer types of diffusion imaging, diffusion spectrum imaging (DSI) and high-angular resolution diffusion imaging (HARDI), and their variations have begun to replace DTI in recent years. Although they differ in their details, HARDI and DSI ultimately work by detecting the movement of water in many more directions within a given voxel—a 3-D pixel of the brain recorded by MRI machines. The Scientist asked methods developers and experienced users what newcomers should know about dMRI and how to get started. Here are the basics. DTI, HARDI, and DSI: What’s the difference? 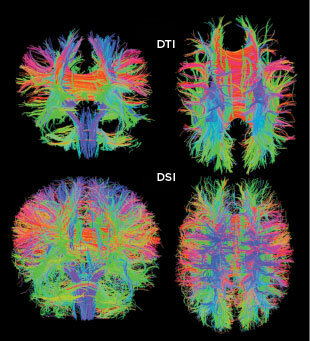 CAPTURING MORE CONNECTIONS: Compared with conventional diffusion MRI (diffusion tensor imaging or DTI), diffusion spectrum imaging (DSI) can drastically improve tractography.SCOTT GRAFTONDiffusion tensor imaging (DTI) is the first and the most commonly used dMRI method. It allows researchers to obtain two key measures. One is called fractional anisotropy: the preferred direction of water movement in a given voxel. The other is mean diffusivity, or the average rate of diffusion across the voxel. Together, the measures approximate the microstructural integrity of the white matter for each voxel. Fractional anisotropy as measured by DTI gives a single direction for water movement per voxel. These different directions are stitched together computationally over the totality of recorded voxels to provide a large-scale representation of where fiber tracts are going in the brain, a method called tractography. However, experts do not recommend using DTI for tractography, because “as soon as you get an area where fibers are bending or intersecting with a different fiber group, you essentially cannot trust your [fractional anisotropy] anymore,” says Do Tromp, a graduate student at the University of Wisconsin–Madison, whose blog diffusion-imaging.com serves as a resource for newbies. So, DTI might work well to pick out obvious differences in larger fiber bundles between one group of subjects and another, but it misses as much as three-quarters of the brain’s structural connectivity because there are so many intersections, says Scott Grafton, director of the Brain Imaging Center at the University of California, Santa Barbara. 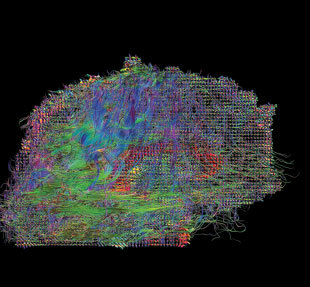 Some fiber bundles, such as the arcuate fasciculus, which connects two language areas of the brain, don’t always show up in an individual’s DTI scan, he adds. Newer data-acquisition schemes, notably HARDI, or high-angular resolution diffusion imaging, start to address the challenge of imaging crossing fibers by applying a stronger magnetic gradient for a longer time and capturing many more images of diffusion in various directions. Exactly how many more directions than DTI is debatable, says Matthew Glasser, a graduate student at Washington University in St. Louis and a member of the NIH Human Connectome Project (HCP) team, but it’s usually on the order of hundreds (DTI is typically around 30). That’s at a given magnetic gradient strength. Nowadays, researchers take HARDI a step further by looking at many directions of diffusion in weak, medium, and strong magnetic gradients in the same subject, a strategy called multishell HARDI. Diffusion spectrum imaging (DSI) is another, related way of overcoming the limitations of DTI. First described in 2005 by Van Wedeen of Massachusetts General Hospital, a principal investigator on the HCP, this method also measures in many different directions, but it uses a lot more magnetic gradient strengths (typically around 20) than multishell HARDI and acquires data in a different pattern. As expected, the analysis of DSI data is more involved than with HARDI and DTI. Which diffusion MRI method should I use? You don’t necessarily have to choose right away between DTI and HARDI. If time allows, you could try to capture more directions with DTI and squirrel them away for HARDI analysis, Tromp says. The answer to whether you should use multishell HARDI or DSI is more complicated, and depends on whom you ask. Compared with DSI, HARDI is “a bit more efficient in terms of how much useful information [about fiber orientations] you get out of it relative to how much time it takes to acquire,” which makes it better for tractography, says Glasser. Mukherjee says that some people think multishell HARDI’s data are easier to conceptualize and analyze than DSI’s. Conversely, DSI allows some more advanced measures of white matter microstructure than HARDI. For Grafton, “the 40-minute DSI scan beats everything.” The problem is that 40 minutes is just too long for a person to hold still, he adds. But newer scanners that do simultaneous multiband imaging are already solving this problem, cutting scan times in half. In some ways the distinctions between HARDI and DSI and their variations won’t matter, as they become “part of a broader sampling methodology where you sample randomly and reconstruct with some clever algebra,” Wedeen says. 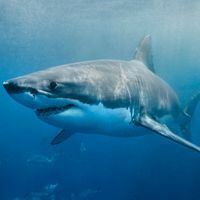 As more data from the various HCP scanners and protocols become publicly available, researchers can make their own comparisons and judgments, he adds. Whether you wind up doing DTI or more advanced methods will depend, in part, on the capabilities of your MRI machine. Each direction and each gradient strength you apply requires one whole scan through the brain, and those take time. For diffusion MRI, you should know about two scanner specs in particular, says Glasser. One is the strength of the base magnetic field, which is measured in Tesla (T). The HCP, for example, uses both 3T and 7T scanners. The other parameter that’s important is the maximum gradient strength (measured in millitesla over distance). That is, from one point in space to another point, what’s the maximum difference in magnetic field the machine can induce? More standard clinical 3T scanners, such as the Siemens Trio, apply a gradient strength of 40 mT/meter. On the other hand, the custom-built Siemens scanner used in the Human Connectome project is like no other: 300 mT/m. In general, “look for the scanner with the strongest gradient you can find,” Wedeen says. Siemens’ MAGNETOM Prisma scanner applies double the gradient strength of the Trio (80 mT/m), and is sufficient to do HARDI methods similar to those used in the HCP, he adds. GE Healthcare, using the Discovery MR750 3.0T for concussion research in collaboration with the National Football League, is also working to improve gradients and other capabilities of their scanners, notes the company’s MR Communications Manager Amanda Gintoft. CHARTING CONNECTIONS: The Human Connectome Project is using HARDI (high-angular resolution diffusion imaging) and tractography to generate detailed maps of structural connectivity in the brain. COURTESY OF THE LABORATORY OF NEURO IMAGING AND MARTINOS CENTER FOR BIOMEDICAL IMAGING, CONSORTIUM OF THE HUMAN CONNECTOME PROJECT. WWW.HUMANCONNECTOMEPROJECT.ODiffusion MRI analysis involves multiple steps, from preprocessing the images to remove artifacts generated by head movement, for example, to performing voxel-by-voxel comparisons of diffusion in different brains. There’s also tractography. There’s no standard way to analyze dMRI data. The major challenge is to combine all your diffusion scans to make a continuous, complete 3-D map of diffusion and the probable orientations of diffusion through the whole brain, Grafton says. The good news is that there are many tools and toolkits available and new ones coming out all the time. “Many of these tools are free and you can download them online with some example data, and it’s kind of fun,” says Matt Cieslak, a graduate student in Grafton’s lab. Cieslak and Grafton recently described a strategy called local termination pattern analysis for comparing white matter morphology in different individuals or groups of people (Brain Imaging Behav, 8:292-99, 2014). The software package (called DSI2) for this tool is now available on the software repository GitHub (github.com/mattcieslak/dsi2). A library of analysis tools for imaging data from structural, functional, and diffusion MRI. FSL has the basics that beginners need, such as the preprocessing steps and the ability to align different subjects for voxel-by-voxel comparisons of DTI scans, says Tromp. An open-source software toolkit for diffusion MRI processing. It includes standard techniques as well as some more advanced methods. “You can do a simple DTI tensor estimation or the fancier HARDI. You can do tractography in different ways. They have it all, and they always use the newest methods,” Tromp says. Developed by Van Wedeen and Ruopeng Wang, the free software allows for fiber tract reconstruction by computing the corresponding virtual streamlines, or tracks, from DTI, DSI, HARDI, and other dMRI data. It’s a great way to get a qualitative look at tracks, Cieslak says. A free tool developed by Frank Yeh of Carnegie Mellon University in Pittsburgh, DSI Studio provides reconstruction methods for DTI, HARDI, and DSI data, and for equivalent or more-advanced imaging methodologies. A library for analyzing dMRI data in the programming language Python (Front Neuroinform, doi:10.3389/fninf.2014.00008, 2014). 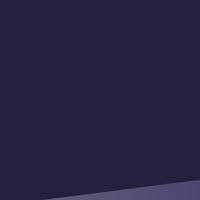 Open-source and free, Dipy is hosted on GitHub. DTI, DSI, and HARDI all have implementations in Dipy, says developer Eleftherios Garyfallidis of the University of Sherbrooke in Canada. At the moment, you need to know a bit of Python and imaging basics to get the most from Dipy, Garyfallidis says. “[But] we have trained people from many different disciplines. 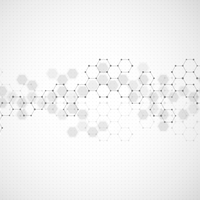 Medical doctors, psychologists, physicists, biomedical engineers, computer scientists—all were able to use Dipy. We’re working on making it even simpler,” he adds. Released in September 2014, Workbench version 1.0 is a free and open-source tool for visualizing and mapping neuroimaging data, including dMRI data. Where and how can I learn dMRI? If there isn’t a dMRI course offered through your university, then you might consider day- or week-long educational symposia offered by software developers or imaging societies. For example, FSL offers an annual course in early spring or summer (2015 dates not yet announced). In addition, the Organization for Human Brain Mapping and the International Society for Magnetic Resonance in Medicine often offer courses at meetings, which are a good way to stay up to date on the newest methods. Researchers with a more clinical focus should check out the American Society of Neuroradiology or the American Society of Functional Neuroradiology, Mukherjee says. You don’t have to wait for a course to be available to get started, however. Tromp, for example, mastered DTI on her own: she borrowed code from friends and started to learn what each step in the code meant. Dipy and other free online tools are another way beginners can learn both the theory and the practice of dMRI.